Let's see. When I left you last, Don and Brenda were just stepping off the plane in Corozal. Suffice to say, we had gorgeous weather for their visit. Morning rise and shine for more spectacular sunrises were the order of the day. We didn't make Don and Brenda work near as hard as we did Owen and Sandy. One other thing that was different was that we at least had kitchen cabinets and a working kitchen sink. Woo hoo! It's the simple things in life, y'know? 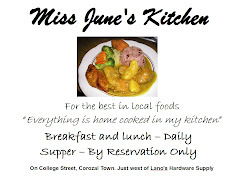 I took Don around to several of the finer spots in Corozal, Lano's Hardware, Cinty's, the un-named tortilla stand under the awning, places like that. I've mentioned before that we went to Bill and Jenny's Cerros Beach Resort for a beer and some lunch. Well, this time we did it one or two better. We actually went there and stayed. We rented two cabañas (notice the fancy tilde'd n?) and spent a night there. The first evening, Bill (who is a world-class professional chef) prepared the four of us a great shrimp ceviche. He proudly told us his ceviche (only prepared to order, no pre-made ingredients) had just won Lonely Planet Magazine's "Best Ceviche in Belize". It's hard to describe just how good his ceviche really is. For one thing, it's huge - arriving at the table is a platter piled inches high with the tastiest mix of veggies, shrimp, or conch (when available) and lime juice, plus some other spices. A full meal for four. We spent the night in our cabañas. With the resort being completely solar/battery powered, there were no fans in the cabañas. I didn't find that to be an inconvenience. I took a cool shower and hit the sack. I had a great sleep, no bug annoyances or anything. On the other hand, Don, Brenda, and Dianna all reported various minor discomforts - being too warm, no air circulation, couple of mosquitos bugging them, etc. All did get enough sleep - well enough to be able to face the coming day in fine fashion. The following morning we arose to another of those terrible sunshine-filled days that we have to endure down here. So, to make it through the day, Don and I had to go fishing. I mean, they forced us to go! 0800, or thereabouts, we had to trudge down to the dock at the resort and get into the boat. What a boat, though. Outfitted with a couple of plush, padded deck chairs, we traveled in style out to the fishing spots. We had a very knowledgeable captain in Eduardo. We fished for snapper, mostly, and a few other targets of opportunity. Of course, one of the mainstays in our area (we can see them daily from our deck at home) is the hard-working Frigate Bird. These guys have it really rough. They hunt up thermals and spend the entire day floating on air, hardly moving a muscle. A right properly and gentlemanly way to fish. All we had to do was cast and reel in, cast and reel in. We didn't even have to bait our hooks. We got back about 4 PM. And ended up catching 4 nice pan-size black snappers, 3 catfish which we threw back and one sucker shark, which we also returned to the deep. On returning to the resort, Brenda and Dianna greeted us at the dock with hugs and kisses. Ok, maybe not quite that dramatically - they did greet us with cold Belikins - that they were drinking! We had to go to the bar to get our own beers. I guess they really missed us. We stayed for supper at the resort. Bill whipped up our snappers into a really great dinner for the four of us. Grilled snapper, Fettuccine Alfredo, and fresh veggies. A delightful way to finish off the fishing trip. After dinner and a few more Belikin, we drove (in the dark) back to the ferry and home. that drive is enough during daylight. At night, it is something unique, as is the ferry ride in the dark. Something to be experienced for sure! Getting back home, meant time for Don and me to try to configure the wireless print server Don brought down for me. We worked for two days on that and still couldn't get it right. Arrrghhh! How frustrating. Since I have the Satellite modem and wireless router positioned in the "attic" over the bathroom, it was easier for me to mount a ladder with my laptop to try to configure the server. After a couple of days, this got to be really uncomfortable. After a day or two relaxing around the house, the four of us headed off to San Pedro on Ambergris Caye. I was lucky enough to be able to claim the right-hand seat up front with the pilot. What a treat! I can only imagine what Brenda thought. She wasn't real sold on flying in such a small single-engined plane anyway, and there I go, up to help the pilot fly the thing... She came through in good fashion anyway. As we flew from Corozal to San Pedro, we passed over the New River and the ferry we had crossed coming back from Bill and Jenny's. Here we are approaching the San Pedro Airport. Takeoffs and landings are the coolest parts of any flight, and it's especially so when you have a front seat view. On arrival at San Pedro, we took a cab to the Hotel San Pedrano, about 4 or 5 blocks north of Ruby's Hotel, where we have previously stayed. The San Pedrano is a small, clean, economical ($45 US per night) hotel. AC or fans are the options. Our rooms were on the second floor, facing the street. It had comfortable beds, TV with a remote that required two hand operation (to keep the batteries in while you pushed the buttons). We made the rounds of the stores and eateries and watering holes in San Pedro. All of it fun. Dianna and I picked up some coozies (zippered beer bottle bras or wet suits) for home, some extra key chains, and a custom shirt for me, and pants for Dianna. As part of our visit to San Pedro, we wanted to give Don and Brenda a true taste of island life. So, we took the water taxi over to Caye Caulker, whose theme is "Go Slow". Of course, after that long (20 minute) taxi ride, we had to find a place to relax. The beach-side bar we found had a hammock that Don just had to try out. Dianna took time to stop and smell the roses... or whatever they were. 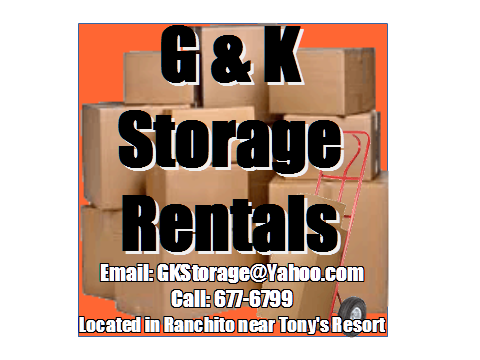 From San Pedro, Don and Brenda took off for Belize City and the International Airport, heading back to that four-letter word - w-0-r-k. We, on the other hand, were faced with a 15-minute flight back to - what is it, Paradise? Oh yeh, part of being in paradise is putting up with tropical whatsis... in this case, a severe case of diarrhea. I had it for about 4 days. Major bummer. I was already dehydrated beforehand. Then catching whatever bug it was, just exacerbated the situation. I'm just now getting myself re-hydrated sufficiently. Thanks Brenda, for the azithromycin cocktail. It worked wonders. 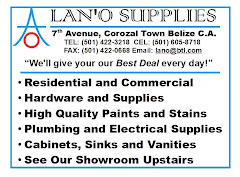 So, here we are, back again to the mainland and home once again in Corozal. We started a new project. As if we didn't have enough to do already. Cody is putting in curbing to define the plant beds and the driveway/walkways. After we get the curbings in, we'll bring in black dirt for the beds and white crushed and 1" gravel for the driveway and walkways. That will go a long way to making the place look sharp and finished. Here's a familiar face showing back up. Abraham Camara. Who had been here with Franz and crew for most of the construction of the house. After their part of the project was done, they all went over to San Pedro to work on a three-story condo project. Abraham wasn't thrilled with it. Being gone all week from his family, plus no extra pay, plus the expense of living in San Pedro, forced him to head back to Guinea Grass and home. Unfortunately, that meant no pay either. He called us to see if we had any work. As luck would have it, his timing was perfect. I was thinking about hiring another worker for a time for some smallish projects. So we hired Abraham. He's a good and skilled worker, so it was easy to bring him aboard. My project is doing some mahogany quarter-round moulding. Here, I've varnished it, and soon will be putting it up on the porches, to get ready for screening in the porches. We finally got all of our kitchen cabinets in. The plate rack and the pantry are all in place. Now all we have to do is tile the kitchen counter, the divider bar, and the bathroom. After these projects, the only stuff remaining for the house itself is to have Cody and Abraham cast the downstairs floor as we're going to wall in the whole downstairs, making the house truly two levels. After that, we'll build a parking palapa for two or three vehicles, then the swimming pool, and guest/party house. Then we're done - I think. And finally for this addition, Dianna noticed this feller on one of the lamp posts the other day, so I snapped a couple of shots of it. Turned out pretty good. This praying mantis is about 4 or 5" long. We thought you'd like to see her. You helped me answer a question about Mennonite homes in the Belize Forums. Do you mind me asking - how much (not including the land) has the construction of the house cost you and Dianne up to this point in time? If you are not comfortable answering me, I understand. 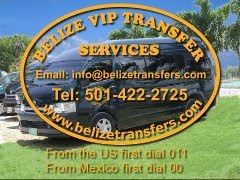 If you don't mind, my name is BBelle on Belize forums or you can contact me at jill_fmc@hotmail.com. As an aside, you mentioned early in your blog that you wanted a t-shirt from BATSUB. I work at BATUS (British Army Training Unit Suffield) in Canada. I have a t-shirt from my dept. It has my name embroidered on the side, but I'm sure you could easily remove it. I don't wear it, it's a big t-shirt as I'm a big girl so it might be too big for you. It's around the house somewhere, I jsut have to find it. But if you want it I can post it to you. 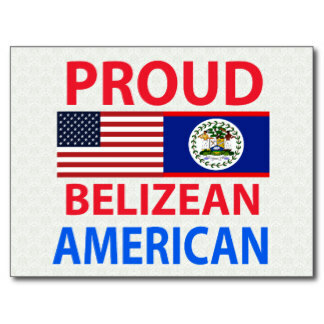 No worries if you don't since it is not Belizean. Wow! You're really digging into the archives! Your question prompted me to dig into my MoneyDance (open source financial software) to see just what we did pay for everything.